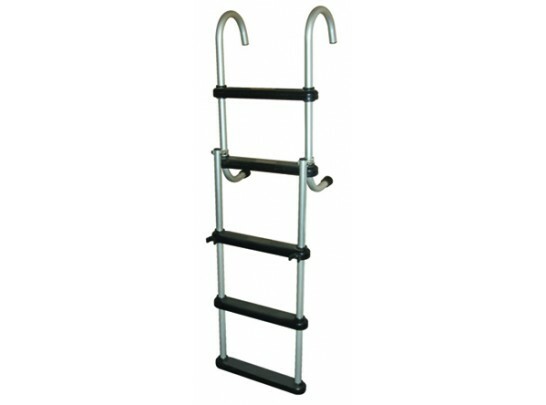 Sturdy 5-step ladder designed for pontoon boats. Ladder can remain mounted on the deck in its folded position when the pontoon boat is moving. Constructed of 1" diameter anodized aluminum tubing. Integrated swim handles provide support to aid climbing. Wide, comfortable plastic steps allow safe, easy boarding. The ladder snaps in and out of the included flush-mount cups in the deck and can fold in and lock to itself. Price includes tax and shipping. * Lightweight/floats * 300 pound capacity * 1" diameter anodized aluminum tubing * Overall width: 16" * Length Stowed: 41" * Length Deployed: 54-1/2"